With cell phones, laptops, and tablets becoming a part of your child's life at an earlier age, there has never been a greater need for earphones designed for children. 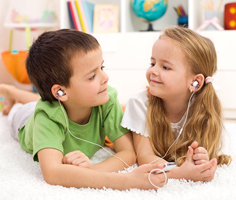 When your child needs earphones to listen to his or her smart phone, MP3 player, or other sound source, choosing the right earphones can help you ensure that your child is playing and listening safely - without damaging his or her ears by cranking up the volume. All of our earphones and headphones for kids feature a built-in volume limiter to give you peace of mind that your child will not damage his or her hearing by accidentally playing their music at a dangerously loud level. These great little earphones made specifically for kids like yours include many features children and parents alike will love, such as bright and fun colors, built-in volume limiters, and child-sized ear pieces that comfortably fit those little ears. Ety-Kids EK5 Safe Listening Earphones make it easy for you to let your kid listen to music, movies, and video games with high definition sound -- without ever having to worry about your child's hearing heath. Built in volume limiting meets Etymotic high definition sound. Ety-Kids EK3 Safe Listening Earphones make it easy for you to let your kid listen to music, movies, and video games with high definition sound -- without ever having to worry about your child's hearing heath. Built in volume limiting meets Etymotic high definition sound. Smart phone headset.